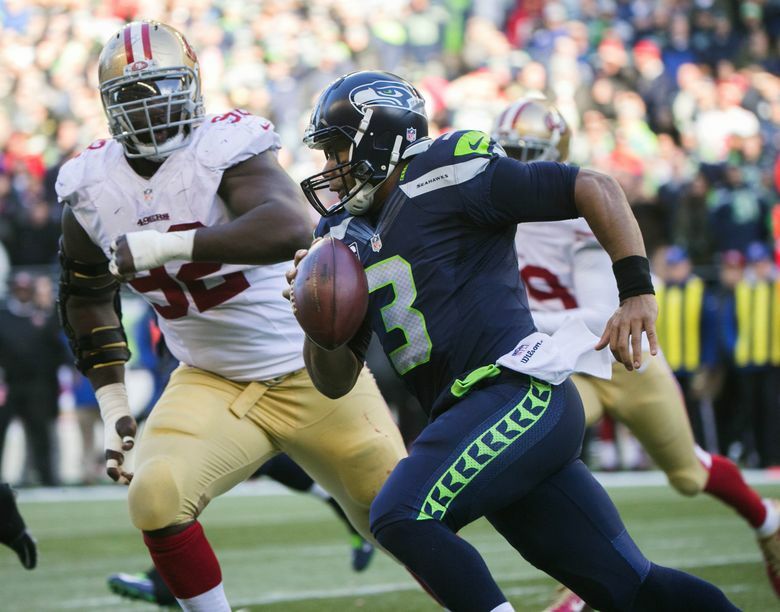 The Seattle Seahawks' playoff odds improved markedly with the events of last weekend. The Seattle Seahawks not only got a much-needed win Sunday against the San Francisco 49ers but they also got a lot of help from other teams around the NFC in terms of playoff positioning, specifically losses by the St. Louis Rams and Minnesota Vikings. — FootballOutsiders.com is pretty bullish on the Seahawks, giving them a 54 percent chance to make the playoffs, up 11.7 percent from last week. That includes a 49.2 percent chance of winning a Wild Card berth, actually better than the Falcons, who at 6-4 are a game ahead of Seattle. The Falcons are listed at 37.3 percent to get a playoff spot, down almost 23 percent from last week following a loss to the Colts, their fourth defeat in a row. FO, in fact, gives Seattle the best odds of any team in the NFC for getting a Wild Card spot. FO, though, gives the Seahawks just a 4.7 percent chance of winning the NFC West. — Fivethiryeight.com gives Seattle a 45 percent chance to make the playoffs, 9 percent to win the division and 2 percent to win the Super Bowl. The site also gives the Seahawks a 65 percent chance to beat the Steelers on Sunday. The site, though, still lists both the Vikings (72 percent) and Atlanta (48 percent) ahead of the Seahawks in the hunt for a Wild Card berth. — MakeNFLplayoffs.com actually has some of the more pessimistic odds for the Seahawks, giving them a 28.4 percent chance to make it and saying that they “need to win six of the remaining six games to virtually clinch a playoff berth. — NumberFire.com has Seattle at 35.9 percent to make the playoffs, up 12.62 percent. NumberFire.com also has Seattle at 1.94 percent to win the NFC West (Arizona won again to improve to 8-2, leaving the Seahawks three back with six to play plus having no chance to get the head-to-head advantage). Interestingly, it gives Seattle a better chance of winning the conference title at 2.02 percent, while giving the Seahawks 0.82 percent odds of winning the Super Bowl. The next two weeks figure to go a long way toward determining Seattle’s playoff hopes as the Seahawks play a 6-4 Pittsburgh team this Sunday and then at a 7-3 Minnesota team next Sunday. Then comes three games against teams with losing records — Baltimore (3-7), Cleveland (2-8) and St. Louis (4-6) — before a road game at Arizona. The trick for the Seahawks may be to either somehow make the Arizona game relevant for the division title, or have that game mean nothing in terms of the playoffs. The odds, though, indicate that may be unlikely.